History: The life of Moira Kinross, later MacTaggert, is largely defined by a life drawn to controversy. Her commitment to the mutant cause has roots in a childhood that offered little indication of such controversy at first. She was the middle child of three children. Her parents were both were both well-educated, middle-class professionals in the suburbs of Dublin, Ireland. While she was born relatively healthy, both her siblings developed significant health problems throughout their childhood. Her older sister was diagnosed with leukemia at age eight and her younger brother was a diabetic. Moira’s mother, who was a nurse, dedicated much of her time into caring for them. As a result, Moira adopted an early interest in medicine. That interest nourished a gifted intellect that led her to skip two grades in primary school. By the time she was 15, she was enrolled in a prestigious preparatory school. It was here where she was first introduced to the emerging field of mutants. Originally, Moira’s interest was mostly in nursing and genetic illnesses. Then one day it was revealed that the principal of the school’s own daughter was a mutant. Since mutants were not well-known at the time, he often brought his daughter to the school so that some of the teachers that were versed in biology could help him. He believed that his daughter was sick and kept trying to have them treat her mutation as a disease. During one fateful visit, Moira’s biology teacher allowed her and several other students to participate. Unlike her peers, Moira dared to ask whether this mutant was even sick. While they scoffed at such a notion, it resonated with the young mutant. Later on, they would meet and the mutant lamented to Moira how her father didn’t understand. It led Moira to console her and convince her that she wasn’t a freak. The next day, the Principal's daughter ran away and she was never seen again. This incident led Moira to dedicate much of her studies to mutation. She graduated school at age 18 and later attended college at Oxford where she attained two PHDs in biology and medicine. She later turned down a tenured teaching position to work in a number of prominent genetics labs all over Europe. Her interest in mutants made her line of work controversial. At the time, mutant research was just beginning to expand. Over the years, she published numerous papers on mutation and genetics. She was among the scientists that led many major medical establishments to remove mutation as a disease. This drew the ire of others, but she remained undeterred and soon became an early proponent of mutant rights. Several of her discoveries led to the creation of various pharmaceuticals, which earned her substantial amounts of money and recognition from the British National Health Service. It was here where she met the man who would later become her husband, Joseph MacTaggert. The courtship between Moira and Joseph was relatively uneventful. At the time, Joseph was a rising figure in British politics. He had also recently lost his mother to cancer and believed that Moira’s work with mutants could lead to improved treatments. The two eventually married and within two years, Moira was pregnant with their first child, Kevin. However, there were signs of trouble with Joseph in the time leading up to Kevin’s birth. Shortly after they married, Joseph was elected to Parliament. It was later discovered that he had been involved in a corruption scandal that helped fund his campaign. More scandals followed as Joseph attempted to ascend the ranks of British politics, mostly involving bribery and cronyism. As he fought the scandals, it started taking a toll on his marriage. He became angry and withdrawn, even after the birth of his son. When Kevin was later revealed to be a mutant, it caused an even greater rift. At an early age, Kevin demonstrated strong mutant abilities. Moira often worked with him in her research to help him manage them. His powers involved massive outbursts of psionic energy, which could effectively warp reality. Because of his vulnerable political career, Joseph encouraged Moira to keep their son’s mutant status a secret. This left Kevin an Moira isolated. It also led her to cross paths with Charles Xavier. While she was working with Kevin, Xavier visited the lab she was working with to receive cancer treatments. He quickly developed a rapport with Moira and Kevin. Using his psychic powers, he was able to both assist Moira’s research and help Kevin control his powers. It endeared him to Moira and that gratitude quickly turned into affection. It happened just in time as well because Joseph MacTaggert’s political career finally came crashing down. When it was leaked to the press that Joseph’s son was a mutant, many of his associates turned on him. The various scandals in which he had been involved came to light and as a result he was relieved of his position. He was so enraged that he attempted to attack both Moira and Kevin, blaming them for the loss of his career. Kevin defended his mother with his powers, leaving Joseph injured. Later while he was in the hospital, Moira served him with divorce papers. Over the next few years, Moira assisted Xavier with establishing the Xavier Institute for Higher Learning. While she continued to work out of a lab in England, she made frequent visits to Westchester to help Xavier with his efforts. At first, she supported his efforts to establish a mutant school. But when Xavier began laying the foundations for the X-men, a rift between them grew. She refused to support sending young mutants on dangerous missions that she felt should be handled by the authorities. This rift only grew as Xavier dedicated more and more time to his institute and less towards her. This rift gained a new complication when one of the the part-time instructors as the Xavier Institute, Sean Cassidy, caught Moira’s eye. 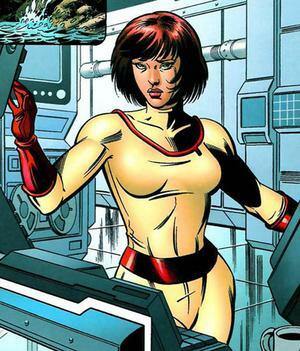 Cassidy, who had been assisting with the training of the early X-men, was also among those who wasn’t in full support of Xavier’s plans for the institute. He and Moira grew closer as a result and Sean would make frequent trips to visit Moira when he wasn’t teaching. Then during a mission against Black Tom Cassidy where Sean rescued a young mutant named Rahne, their relationship took a more serious turn. At first, Rahne struggled with her powers and it was largely Moira’s experience that helped her gain control. As a result, she grew fond of both Moira and Sean. When Sean adopted her as his daughter, Moira became a mother figure. While Rahne would briefly serve in the X-men, this affair led Moira to further separate herself from Charles Xavier. With the money gained from her work and from her divorce, Moira established the Muir Island Research Center for Mutants. This center became the site of the most advanced mutant research in the world. Moira became the lead researcher while Sean became the lead administrator. She still maintained a friendly relationship with Charles Xavier, but she made sure to keep her distance from X-men affairs. That would all change when Kevin’s powers began growing again. They got so bad that he had to be isolated within a special chamber. This led Rahne to quit the X-men and help deal with her ailing brother. This eventually led to an ill-fated experiment involving one of Forge’s machines, which caused Kevin’s powers to manifest at omega power levels, leading him to dub himself Proteus. It led to a horrific rampage through Liverpool that led to a clash with the X-men. Despite their best efforts to save him, Kevin took his own life in the end. It left Moira, Sean, and Rahne devastated. While the long-term impact of this loss on Moira has yet to fully emerge, she remains dedicated to her cause and remains committed to Muir Island. Character Breakdown: Moira MacTaggert has a brilliant mind and a weak heart. Her personality is largely defined by her uncanny ability to reason and her overwhelming inability to control her emotions. Facts and feelings are processed in such a radically different manner that it significantly affects her ability to make reasonable choices, often to her detriment. Emotionally charged situations such as her former husband being exposed, Charles Xavier leaving for Westchester, and her son, Kevin, losing control of her powers display a pattern of exercising poor judgment when emotions are involved. While Moria’s history of poor emotional decisions is apparent, her capacity to love and have compassion runs extremely deep. She demonstrates an ability to maintain loving, emotional bonds with others. She frequently engages in acts of altruism, indicating a level of maturity and understanding that is well above normal. Having had to mature at young age, she developed an enlightened mindset that helped resonate with others like Charles Xavier and Sean Cassidy. Her desire to help mutants despite being human is a major manifestation of this altruism. The X-men and Muir Island are living embodiments of this altruism and despite the death of her son, Moira maintains this dedication. Her innate altruism and capacity to love factored heavily in her role as a mother to Kevin. Even though Kevin was unstable, her dedication to him was beyond dispute. Such mothering instincts complemented not only her ability to form emotional bonds, but also exacerbated her propensity to make emotionally charged decisions. Her love for Kevin kept her failed marriage going longer than it should have. It also led her to make the ill-fated decision to test Forge’s machine on him. So while Moira’s heart may always be in the right place, her ability to reason under emotional situations will often be a liability.